Immigration Minister Peter Dutton’s announcement that he was going to cut the income and housing support from around 100 refugees brought to Australia from Manus and Nauru for medical treatment has created outrage. Around 60 single men and women have had their paltry $100 a week allowance cut and have been given three weeks to get out of their present community detention housing. They have been issued with a six month bridging visa (with the right to work and Medicare) and told that they are expected to return to Manus, Nauru, or to their home countries. Typically, there was no logic to the Immigration Department’s announcement. Women who are victims of sexual assault, cruelly held in detention for two years and released into community detention for just two months were expected to find houses and jobs. Others who have on-going medical issues were summarily cut off support, while others who had been living in the community for a long time and are fit and well, were ignored. But if Dutton thought that his latest piece of nastiness would be meekly accepted, it wasn’t. His decree galvanised all those who have been involved in the “Let Them Stay” campaign since February 2016. The churches who offered sanctuary in 2016, offered it again. The head of the Anglican Church, Archbishop Philip Freier, called Dutton’s decree, “a callous attack on vulnerable people”. Hundreds of people have responded with offers to help to make sure that everyone that Dutton cuts off will be supported and have a roof over their head. 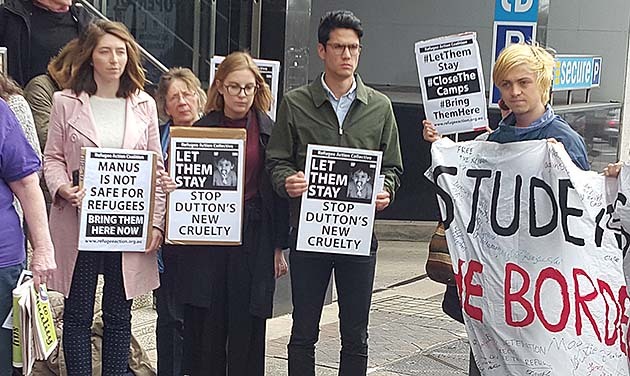 The grassroots movement that stood up to Dutton to say, “Let Them Stay” (most dramatically outside Brisbane’s Lady Cilento hospital to stop baby Asha being sent to Nauru) is not going to allow Dutton to make them homeless and send them back. This time too, the Labor Party opposed Dutton. Bill Shorten called the government’s move, “cowardly and cruel.” Labor is still committed to the also cruel, offshore processing, but Shorten went on to say the people from Nauru and Manus should be settled in the US or “other countries in our region”, putting a small gap between Labor and the Coalition. So far, of the 400 people brought from Manus and Nauru for medical care, only about 60 refugees have had the income and housing support cut. Dutton may end up cutting support from more of the “Let Them Stay” group of asylum seekers and refugees. If he does, even more people will step up to support them. Of course, the refugees and asylum seekers should never have been sent to Nauru or Manus; they should never have been in community detention. They should have had the right to work and been given permanent visas and every assistance to settle in Australia. Nonetheless, Dutton’s move to grant them bridging visas is an admission that he cannot force them back to Nauru or Manus. To that extent, it is a small victory for the “Let Them Stay” campaign and the legal action that has prevented Dutton removing them to Nauru and Manus. Dutton has labelled the lawyers involved in filing such cases “unAustralian”—a label we should proudly wear considering what Dutton and “Australian values” mean to those held on Manus and Nauru. As this article was being written there are still three pregnant refugees on Nauru waiting to hear if they will be allowed to have the terminations they requested weeks ago. One of the women is now 18 weeks pregnant, yet she requested a termination when she was just six weeks. Under new rules imposed by Australia’s Border Force department, IHMS (the medical provider) can no longer approach Border Force directly with abortion requests; requests for “a procedure unavailable on Nauru” must be referred to Nauru’s Overseas Medical Referral (OMR) committee. Border Force will only consider a request from the OMR. Dutton’s twisted ban on abortion targets refugee women in the most barbaric way imaginable. But the barbarism is a direct product of the government’s paranoid determination that no refugee will ever come to Australia. Dutton’s use of the OMR to ban abortions must be fought. And the fight to bring them here just got that much more critical.